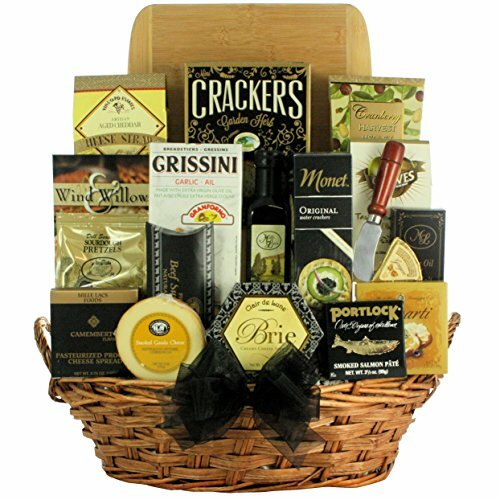 This Cheese & Snack Gift Basket is sure to make a "Grand Impression" upon any recipient. It is an elegant gift that they can enjoy alone or with the help of friends and family. Includes Havarti Flavored Cheese Spread, Smoked Gouda Flavored Cheese, Aged Balsamic Vinegar, Oloves Tasty Mediterranean Olives (Pitted Green Olives with Basil & Garlic), Olive Oil & Sea Salt Crackers, Portlock Smoked Salmon Pate, Cranberry Harvest Medley, Original Aged Cheddar Cheese Straws, and more! Also includes a Wooden Curved Cheese Board, and Curved Cheese Knife Spreader. They will enjoy this basket for any occasion! This Cheese & Snack Gift Basket is sure to make a "Grand Impression" upon any recipient. It is an elegant gift that they can enjoy alone or with the help of friends and family. Includes Havarti Flavored Cheese Spread, Smoked Gouda Flavored Cheese, Aged Balsamic Vinegar, Mediterranean Olives, Olive Oil & Sea Salt Crackers, Portlock Smoked Salmon Pate, and more! Also includes a Wooden Curved Cheese Board, and Curved Cheese Knife Spreader.